His name has a special place in the Sikh history as he sacrificed his life for the Sikhs. The Sikh history is the history of martyrs and Bhai Mani Singh has a special place in the line of martyrs. It is assumed that after the death of Baba Banda Bahadur in 1716, the Sikhs were left without any temporal guide, but to ignore the importance of the part played by Bhai Mani Singh is to miss the significance of the phase itself. Bhai Mani Singh played an important and inspiring role in guiding the desperate followers of Guru Gobind Singh. On account of the peculiar and high position held by Bhai Mani Singh and his great piety, his martyrdom aroused the greatest indignation and it deserves a particular mention. Bhai Mani Singh was born on 10th March, 1644 at village Alipur, near Multan now in Pakistan and was named Mani Ram, but was called Mania. His father, Mai Daas, brought him to Guru Har Rai in 1657 at Kiratpur. On seeing him, the Guru said: Mania will be Gunia (virtuous). He stayed there for about 2 years in the service of the Guru and received instructions in the Sikh lore. In 1659, he returned to his village and was married to Sito Devi daughter of Lakhi Rai. After his marriage, he again returned to Kiratpur and humbly served in the Langar (free kitchen) of the Guru and learnt Gurbani. After the death of Guru Har Rai, he attended on his successor, Guru Har Krishan and accompanied him to Delhi also. After the death of Guru Har Krishan, he returned to Bakala and started serving Guru Tegh Bahadur. He also attended on the Guru at Kiratpur and Anandpur. Bhai Mani Singh has the distinction of belonging to a family of martyrs. Devotion to the Gurus was in his heritage and his family can rightly boast of an impressive record of sacrifices. His grandfather, Balu Ram, had died fighting for Guru Hargobind in 1634. Bhai Dayal Daas who was tortured and executed at Delhi before the martyrdom of Guru Tegh Bahadur in 1675 at Delhi was the elder brother of Bhai Mani Singh. As mentioned by Kesar Singh Chhibbar in 'Shahid Bilas', Hathi Chand, Lehna Singh and Sohan Singh who died fighting for Guru Gobind Singh at different places were younger brothers of Bhai Mani Singh. As mentioned by Dr Rattan Singh Jaggi on page 16 of his book in Punjabi 'Bhai Mani Singh Jivenee and Rachna'(1983) Punjabi University, Patiala, his five sons-Bachitar Singh, Ude Singh, Anik Singh, Ajaib Singh and Ajub Singh gave their lives fighting against the Mughals in 1705. Lakhi Rai who cremated the headless body of Guru Tegh Bahadur at great risk was father in law of Bhai Mani Singh. Bhai Gurbax Singh and Bhai Chitar Singh, sons of Bhai Mani Singh, were martyred along with him in 1734 in Lahore. After the departure of Guru Tegh Bahadur for Delhi, Mani Ram started to serve Guru Gobind Singh and became an important individual in the court of the tenth Master. As written by Chhaju Singh, writer of Shaheed Bilas (1870) sranza 41, he was a true Sikh, preacher, writer and a brave fighter. He accompanied the Guru to the seclusion of Paonta and took active part in the battle of Bhangani in September,1688 and defeated the unreasonable hill chiefs. He came back to Anandpur with the Guru who loved him and consequently the Sikhs respected him. In 1690, he fought bravely in the battle against the Mughals at Nadaun and defeated them. In 1691, the Guru appointed him his minister (Diwan) after Nand Chand. In 1695, he fought bravely when Husain Khan, a Mughal Commander, attacked Anandpur. The Guru sent him to Ramdaaspur (Amritsar) as head priest after the death of Sodhi Har Jee and there he managed the affairs very efficiently. Appreciating his services at Amritsar, the Guru granted him an appreciation letter, Dr. Jaggi has attached the photo copy of that letter at page 7 of his book mentioned above. In 1699, when Guru Gobind Singh created Khalsa, Mani Ram along with his five sons was baptized and Mani Ram became Bhai Mani Singh. According to Dr. Hari Ram Gupta (page 387 of his book 'History of the Sikhs' Vol.1), Bhai Mani Singh escorted Guru Gobind Singh's wives, Mata Sundri and Mata Sahib Kaur to Delhi at great risk. When the Guru reached Talvandi Sabo now called Damdama Sahib, he conducted the Guru's wives there. When the Guru left for Daccan to see Aurangzeb, he sent his wives back to Delhi under the charge of Bhai Mani Singh. Bhai Mani Singh was well known for his scholarship. He was one of the most learned men among the followers of Guru Gobind Singh. His literary and preaching activities distinguished him from others. Giani Gian Singh in his book 'Panth Parkash'(Page69) mentions that he was one of 52 poets in the court of Guru Gobind Singh. In 1706, he rejoined Guru Gobind Singh at Talvanti Sabo where he prepared, under his guidance, the revised copy of the Adi Granth which also contained the compositions of Guru Tegh Bahadur. He transcribed many copies of the Holy Scripture for distribution. His achievement in the literary sphere is his compilation of the Dasam Granth containing compositions believed to be of Guru Gobind Singh. His exposition of Gurbani was appreciated by all. He used to interpret hymns from Gurbani at the daily prayer meetings both at Anandpur and Amritsar. He also went around the countryside preaching teachings of the Sikh Gurus. He visited villages in Jhang district now in Pakistan in 1714-15. He used to interpret hymns from Gurbani. In the prayer meetings both at Anandpur and Amritsar. He sowed the seed and planted Gurmat among all irrespective of caste or creed, His discourses which were very popular were based on the 1st Var of Bhai Gurdaas and other stories he had learnt about the Sikh Gurus. As mentioned by Dr. R.S. Jaggi on page 33 of his book already mentioned, these discourses are recorded by Bhai Surat Singh in the shape of Gian Ratnawli (Janam Saakhi) and Bhagat Ratnawli (Sikhan De Bhagatmala). The first one is about the life of Guru Nanak Dev and is based on the 1st Var of Bhai Gurdaas and the second book is the biography of the Sikh devotees based on the 12th Var of Bhai Gurdaas. These books are attributed to Bhai Mani Singh, but he himself did not write them. These books present a good sample of prose in Punjabi literature and have historical and literary importance. In 1721, Bhai Mani Singh thought that the Adi Granth based on musical measures (Ragas) created confusion. He considered that its rearrangement into separate chapters of every Guru and Bhagat would be easier for the readers to understand. Consequently, he reorganized it after years of hard labor. The Sikhs did not like it and grew furious. He was condemned for tampering with the Holy Granth and cursed that his body would be cut into pieces as he had mutilated with the Holy Granth. According to Dr. Rattan Singh Jaggi, Bhai Kesar Singh Chhibar has mentioned about this curse in his book 'Bansawli Nammah' (Stanzas 378& 379), but this has not been mentioned in 'Shaheed Bilas'. Dr. Rattan singh Jaggi also does not treat it reliable. Dr. Gokal Chand Narang writes on page 54 of his book 'Transformation of Sikhism': It is, of course needless to say whether the curse led to punishment or the punishment led to the invention of the curse. After the martyrdom of Banda Singh Bahadur in 1716, dissension broke out between the Sikhs who were split into two, but Bhai Mani singh who was Head Priest of Darbar Sahib at that time used his influence and wisdom to bring about peace between the warring groups---The Bandai Sikhs who treated Banda Bahadar as 11th Guru and the Tatv Khalsa who treated Sri Guru Granth Sahib the Eternal Guru. There was likelihood of a major conflict between the two groups. Bhai Mani Singh reconciled the two sides by asking them to cast lots. He took two pieces of paper, on one he wrote Tatv Khalsa and on the other piece Bandai Khalsa. Both the pieces were rolled up into two balls and thrown into the holy tank. The paper bearing the name of Tatv Khalsa came up the water first and the holy Darbar Sahib was immediately handed over to them. Thus his sweetness and wisdom settled the dispute peacefully in 1723. Zakria Khan, a fanatic Muslim, was the Governor of Lahore those days. He had strictly forbidden Sikhs to visit Amritsar and bathe in the holy tank, and had deputed Diwan Lakhpat Rai to Amritsar for this purpose. 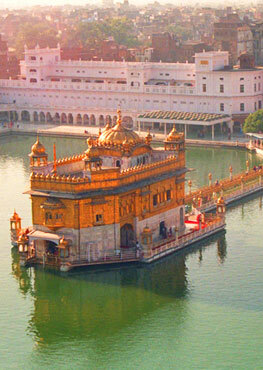 He did not allow Sikhs to assemble and celebrate Diwali at Darbar Sahib. 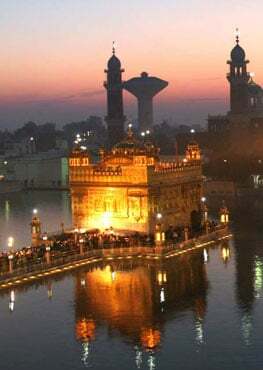 He agreed to permit the Diwali gathering of Sikhs at Darbar Sahib if Bhai Mani Singh paid him five hundred rupees. Bhai Mani Singh agreed hoping to collect the money from the Sikhs when they come to attend the gathering. Bhai Mani Singh sent message all over the Punjab inviting Sikhs to visit Darbar Sahib to celebrate Diwali of 1734. In the meanwhile, he came to know that the Governor was not sincere; his aim was to kill the Sikhs when they assemble and troops were on their way from Lahore. He sent message to the Sikhs, apprised them of the plot and asked them not to come to Amritsar to celebrate Diwali. Consequently, only a few Sikhs turned up and enough money could not be collected and paid to the Governor. Bhai Mani Singh was arrested for nonpayment of the promised money as ordered by the Governor. He was offered to embrace Islam or pay the money otherwise he would be cut into pieces, limb by limb. He refused the offer and was cut into pieces, but this true Sikh of the Guru neither wavered nor lost his poise. He was calm and serene up to his last breath. He was martyred in June 1734 when he was 90 years old at a place where now stands Gurdwara Shaheed Ganj in Lahore. This tragic incident has been narrated in 'Shaheed Bilas', stanza 203. Bhai Mani Singh consolidated the work of Guru Gobind Singh during a critical phase of Sikh history after the death of Banda Bahadur when the Sikhs were losing heart. He moved among the Sikhs as the embodiment of hope and faith. His unwavering faith in the mission of Guru Gobind Singh was a source of inspiration to others. He looked to the future as a new dawn of the Sikh power and dispelled the despondency to which the Sikhs were falling after 1716. By his extraordinary courage and foresight he held the Sikhs together and gave them guidance which led to the path of political power. His martyrdom made the Sikhs relentless enemy of the Mughal administration. They never reconciled themselves to the state which executed their priests and desecrated their shrines. His death furthered the cause for which he had labored throughout his life. From his experience arose his attitude and philosophy of resistance. His name has a special place in the Sikh history as he sacrificed his life for the Sikhs. He was indeed a true Sikh in service and sacrifice. The origins of most of the latter achievements can be traced to the work of men like Bhai Mani Singh. 2. An Article by Dr. Gurtej Singh in Proceedings of Pujab History Conference 1968, Pujabi University, Patiala. 3. Encyclopadia of Sikhism by Pro. Harbans Singh, Punjabi University, Patiala. 4. History of the Sikhs Vol.1 by Dr. Hari Ram Gupta (Punjabi).